Whereas I didn't much care for the flipness and, ultimately, lack of consequence in Final Crisis Aftermath: Run!, I found I liked writer Eric Wallace's Final Crisis Aftermath: Ink despite a somewhat similar premise. Both Run! and Ink spin-off from characters with very specific roles in Final Crisis -- Human Flame being a zero-grade villain who becomes a heavy hitter, and Tattooed Man being a former villain who becomes a Justice League hero. I was impressed with the thematic weight of Ink, however, and it's enough to make me want to follow Wallace and the Tattooed Man one book more, despite the controversy that's sprung up. Wallace deviates Tattooed Man Mark Richards well from the established anti-hero tropes. For one, Richards is not a reluctant hero; rather, in his conversion from villain to hero since Final Crisis, he appears to have embraced with some amount of pride his role as a Justice Leaguer. Second, unlike Starman Jack Knight, for instance, where everyone around Jack roots for him to take the hero role while he pushes it away himself, I found it fascinating how Richards struggles to be a hero even as he's constantly hampered and mistrusted. It's not just Richards' difficulties with the racist Liberty Hill police force, but even his neighbors turn against him when he saves drug addicts and prostitutes alongside the innocent. This last bit is a nice touch; Wallace's police in the story are dutifully corrupt and the gangs expectedly bloodthirsty, but Wallace ultimately allows that no one in the story is entirely unsullied (tied to Richards' own troubled heroism) in the prejudices of the Liberty Hill community itself. Indeed Richards learns that being a hero, as the saying goes, isn't all it's cracked up to be. I wouldn't say Richards exhibits Booster Gold-level pridefulness, but he enters the story with expectations to a certain extent as to the respect heroism will bring him, and ends the story not only having had to give up his family and community, but also taking on some aspects of his former villainy in the pursuit of heroism. Wallace allows for any number of reasons for Richards' dual gain and loss in becoming a hero, from his former bad guy status, to Richards' approach more akin to vigilante Batman than superhero Superman, to the color of Richards' skin (I'm reminded of the question Wonder Woman asked in Phil Jimenez' Paradise Found, "Do you think Kal could act as Superman if he didn't ... appear as he does? If he looked like ... Steel?"). All of these make for a complicated story that demonstrates the complicated way in which Richards' successes and failures are intertwined, leaving open the question of whether Richards is a victim of fate -- with a different life, he could have been a different hero -- or of the circumstances he created. 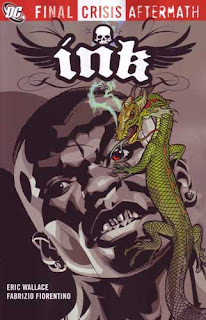 Through much of the story, Wallace suggest to the reader that someone else controls Richards' tattoos and uses them to murder, but we learn in the end that the fault has always been Richards' own. Both Richards and the villain Synck gained their powers through painful experiences, but whereas Synck's power is all external (he controls others who battle for him), Richards' is internal -- the tattoos are a manifestation of his own inner strength. This is good and bad; Richards defines his own path to heroism, but has to deal with the consequences that come with that path. This multi-facetedness is more than enough to make me want to follow both writer and character (and artist Fabrizio Fiorentino's sketchy, appropriately moody art) to Wallace's new run on Titans. Now, I know already about "thing one" that happens and also "thing two" -- as relates to Richards, I'd be more disturbed if it wasn't Wallace writing, but Ink is enough for me to trust Wallace and any changes he might make to Richards, so I'm more content to wait and see than if I felt a new writer had some in and made unnecessary changes. As for that other thing, I'll hold off commenting on that now, too; the operative thing, however, is that whereas I might not have picked up Titans right away before, I enjoyed Final Crisis Aftermath: Ink enough, more than I thought, to give Wallace's next book a try. Now that I finally got a copy of Ink with all its pages intact, just one more Final Crisis Aftermath left for me, and that's Escape. One review, coming up! I skipped this one when it came out in favour of DANCE, RUN! and ESCAPE. But your review makes this sound like the most interesting mini out of all the Aftermath books. I think I'll check it out after all. You know, I just finished reading Escape, and now that you mention it and I consider for a moment, I think it WAS the most interesting of the Aftermath series. Moreso than Run!, which I've mentioned didn't work for me; moreso than Escape, which is largely too esoteric to be a "favorite"; and in terms of having something "going on" behind the pages, tied with and then just a smidgen ahead of Dance. So, I think you're right.